Former Magpies stalwarts Kevin Nolan and Andy Carroll are back in the North East tomorrow – and the time is right for a re-evaluation of their legacy. Former Magpies stalwarts Kevin Nolan and Andy Carroll are back in the North East tomorrow – and the time is right for a re-evaluation of their legacy. Chief sports writer Mark Douglas reports. IT was one of those febrile East London nights that puts hairs on your chest and sends the adrenaline coursing through your veins. In October 2010, Newcastle United travelled to Upton Park on the precipice of a revolution. Newly-promoted to the Premier League under the charge of Chris Hughton, the reserves of momentum were beginning to run dry and the knives were out for the manager. Word had filtered through to the dressing room about unhappiness in the boardroom. It was an open secret that there was deep-seated doubt about the influence and ability of a core of influential players that had helped re-establish Newcastle after the ridicule of their reprehensible relegation, and the slew of salacious headlines that followed star man Andy Carroll around were hardly helping Hughton’s cause. Implausibly, the striker had recently moved in with his club captain after his car was set on fire. With internal strife abounding, West Ham sniffed blood but, in the event, Carroll and Kevin Nolan provided the ultimate riposte. Both scored and played like men possessed to reassert the popular perception that they were the heartbeat of the reborn Newcastle United. But it was a revolution delayed rather than quelled. Mike Ashley fired Hughton soon after, and Carroll was sold in January. Kevin Nolan, having asked for the long-term contract that he felt he was owed, discovered that Newcastle’s new direction was not going to tally with his own ambitions – both financial and professional. At the time there was disquiet from United supporters, although not perhaps as much as Nolan might have hoped for. His contribution was a major one, and moved one senior player of serious standing in the Newcastle dressing room to hail him as the best captain he had ever known at St James’ Park. His goals, his drive and his obvious pride at holding the captaincy of a great northern club were impressive traits. But the emergence of a new Newcastle in the wake of his departure has prompted a re-imagining of the importance of the decision. It now looks like a canny move by brave owners, rather than a spiteful one borne out of malice for the tussles that used to take place between the board and influential Players’ Committee. The Newcastle of 2012 are a very different club. The dominant characters in the dressing room now are Fabricio Coloccini, Yohan Cabaye and the cool, aloof authority of Demba Ba – who all demand exacting standards of their team-mates and are not backward in coming forward when they see someone straying from them. It is a little-known fact, for example, that Coloccini was the one who first confronted Joey Barton over his errant Tweeting as the troubled midfielder careered towards crisis point in black-and-white. It was a strident confrontation that seemed to mark a line in the sand, and a shifting in the dressing-room dynamic. Could Newcastle have evolved with Nolan still in the camp? He was not a disruptive influence like Barton, but perhaps his man’s man approach would not be quite as effective in United’s cosmopolitan squad, with its chemistry that allows flawed maestros like Hatem Ben Arfa to prosper. Tomorrow he returns in the claret of West Ham, the club – ironically – which he helped drain the fighting spirit out of that day in autumn 2010, and it seems like the time is ripe for re-evaluation. Alan Pardew worked with Nolan for five months and was supportive of the midfielder. He did not want him to go but recognised the collision that was on the horizon when Nolan’s contract difficulties began to over-shadow his importance to the club. There was no great betrayal – and the two remain on good terms – but Pardew had to let him go for the greater good. Not that the manager subscribes to the idea that Newcastle have “moved on”. No, he contends, both Carroll and Nolan would be welcome in his squad. “Both of those players would be good additions to this squad, but players have to move on for the sake of the team,” he explained. If he scores tomorrow afternoon, there might be a wink in the direction of the boardroom – even if the player would be unlikely to celebrate. Pardew admits it is a distinct possibility considering the ability that the midfielder possesses. “He can do that, he has been terrific for West Ham and a major factor in them having as many points as they have,” he said. Newcastle’s stunning success in their first season after Nolan means that few supporters would yearn for his return. But United, who are performing so admirably in Europe this year, now need to begin to consolidate in their third year back in the top flight. Thus far their Premier League form has been mixed. “The big thing for me is we have only lost twice in the league,” Pardew said. “Think when you look at clubs in mid-table, that’s always a good indication of whether they are going to be a success and come forward. “It’s not often you can lose less than 10 games in a season and not finish in the top six. Carroll will be back, too, along with Sam Allardyce. Pardew will reserve a handshake for both, and for Nolan. “The position we are in, if I’m honest, is because we used the money from Andy’s sale well,” he said. “He was a brilliant player for us, but the fee was astronomical. We’ve used it well and we owe a great debt to him. I’m looking forward to seeing them both and I enjoyed working with them. 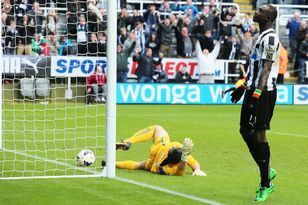 IT IS the image that sums up Newcastle United’s midwinter of discontent. THE heartfelt tributes to Fabricio Coloccini’s outstanding individual performance in Sunday’s derby match continued from both inside and outside the Newcastle United camp.